STILL reeling from the loss of big man Ian Sangalang, Purefoods Star is set to bolster its frontline in time for the PBA Philippine Cup playoffs. 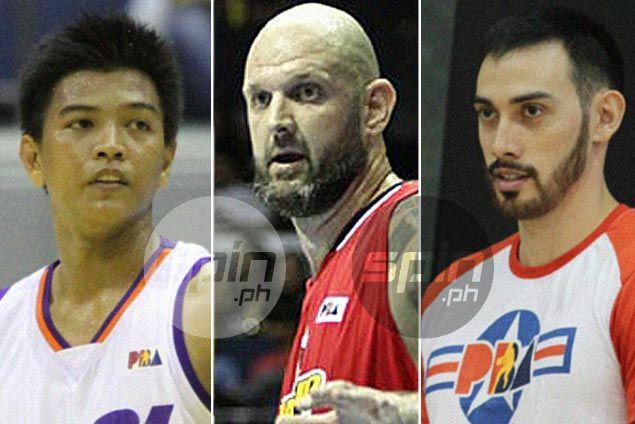 A source told Spin.ph on Saturday that Purefoods is acquiring the services of veteran slotman Mick Pennisi from the Barako Bull in exchange for seldom used big men Isaac Holstein and Ronnie Matias. The trade papers were on their way to the PBA Commissioner's Office for approval, a source said, although Purefoods is in no rush to get the deal done since its game against Barako Bull was moved from Saturday to Tuesday owing to the threat posed by super-typhoon Ruby. The 6-9 Pennisi, a 14-year veteran with a sweet touch from the outside, should be a welcome addition to Purefoods' frontline as the reigning grand slam champions fight for position heading to the playoffs of the season-opening conference. Purefoods coach Tim Cone has mostly relied on Marc Pingris, Joe Devance, Rafi Reavis, and Yousef Taha in the middle this season after losing Yancy De Ocampo to GlobalPort and Sangalang to a season-ending ACL injury. On the other hand, Holstein was deemed as a project when he joined Purefoods two seasons ago but rarely got the chance to play, as with Matias since his arrival from the defunct Air21 team. The two should finally get the chance to play at Barako Bull, which like Purefoods is fighting for position heading to the playoffs. It is the second time in less than a month that Barako Bull traded a top player to SMC-owned teams. On November 10, it sent promising guard Jeric Fortuna to the Beermen in exchange for Paolo Hubalde.